John Milton Binckley: Legal Advertisement. "CONTESTED LAND CASES on Appeal, or otherwise, requiring argument or investigation. Suspended land claims of States, corporations or individuals. Suspended entries, etc. The under-signed, lately in charge of the preemption bureau, may be consulted at No. 424 Pennsylvania avenue. Refer to officials of the Land Department. dec 9-1m* JOHN M. BINCKLEY." 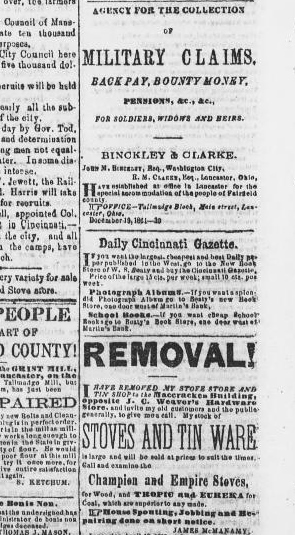 The National Republican (Washington City): January 07, 1862, page 4. Chronicling America: Historic American Newspapers. Library of Congress. Link here. AGENCY FOR THE COLLECTION OF MILITARY CLAIMS, BACK PAY, BOUNTY MONEY, PENSIONS, &C. &C., FOR SOLDIERS, WIDOWS AND HEIRS. BINCKLEY & CLARKE. JOHN M. BINCKLEY, Esq., Washington City, E. M. CLARKE, Esq., Lancaster, Ohio Have established an office in Lancaster for the special accommodation of the people of Fairfield county. OFFICE - Tallmadge Block, Main Street, Lancaster, Ohio. The Weekly Lancaster Gazette. September 11, 1862, page 2. Chronicling America: Historic American Newspapers. Library of Congress. Link here.